Range: A Northern leopard frog range is most of northern North America, except on the Pacific Coast. Habitat: Ordinarily they live near ponds and marshes, but will often venture into well-covered grasslands as well. Diet: Leopard frogs are carnivores and will eat just about anything they can fit in their mouths. They eat beetles, ants, flies, worms, smaller frogs, including their own species, and even birds, and garter snakes. Notes: Most people will be familiar with this frog as it is the most common frog used in high school dissection classes. Another interesting fact is that the northern leopard frog, particularly the legs, are a culinary delicacy. Northern leopard frogs get their name from the dark oval spots that cover their metallic brown and green bodies. These spots are often contoured by a lighter yellow colour, and the number of spots varies by individual. These frogs can attain lengths of two to four inches and have very distinct eyes, which are orange/gold in colour with horizontal black pupils. Unfortunately, these little guys are experiencing some problems. Their prairie population is listed as being of Special Concern, and the Rocky Mountain population is considered Endangered under the Species at Risk Act (SARA). 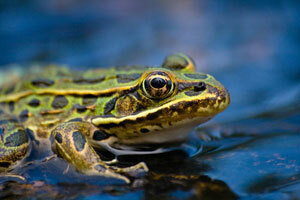 Continue reading to find out what’s harming leopard frogs and what you can do to help them. 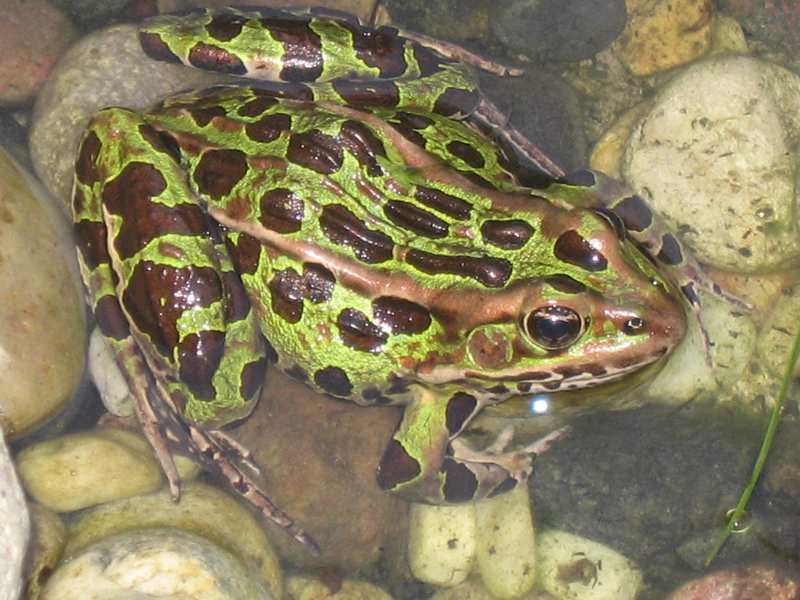 The Northern leopard frog is widely distributed in Canada and can be found across all provinces. While they are primarily nocturnal, they are also commonly observed being active during the day. Northern leopard frogs are a semi-terrestrial species, meaning that they live both on land and in water. They spend the majority of their time in meadow and field habitats containing ponds, rivers or lakes and will often venture away from the water to forage. As adults, they will maintain home ranges of up to 600 square metres during the summer months. Once they have reached maturity, Northern leopard frogs gather in breeding ponds early in spring. Males arrive first, often before the last frost, and float in the warmest part of the pond calling out to potential mates. Females usually follow within a few days and cluster along the shoreline. Mating season begins between late April and early June and takes place over a period of a few days up to a week. Each female mates only once and lays clusters of between 1,000 and 5,000 eggs. She attaches the clusters to submerged vegetation or allows them to float on the surface of warm shallow waters. It takes approximately nine days for the eggs to hatch and a few additional days for the young to become free-swimming tadpoles. Because frogs are aquatic as juveniles, they are born without legs and must undergo a metamorphosis to become a fully fledged adult frog. This tends to occur around late July when the legs and arms have grown and the tail has receded. When they emerge, the juvenile frogs are only on average 3.5 centimetres in length and take two years to reach maturity. In the wild, these animals have an average life span of four years; however, they have been known to live up to nine years in captivity. While we are taught as children that frogs eat flies, in reality their diets are much more varied. As adults, Northern leopard frogs do not discriminate among prey species, eating virtually anything that moves and that will fit into their mouths. Most commonly, frog cuisine includes insects such as beetles, ants, flies and leafhoppers, in addition to some invertebrate prey including worms, snails and slugs. Adults are known to cannibalize their own species, eating the smaller members including juveniles. 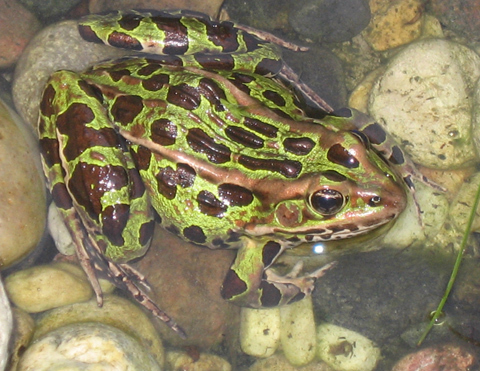 Large Northern leopard frogs may also occasionally consume small vertebrates such as voles, birds and even garter snakes. Tadpoles are herbivores, grazing primarily on algae. To hunt, Northern leopard frogs will often sit patiently and wait for prey to come close before they stalk and ultimately leap to consume their prey. Aside from falling prey to a variety of predators such as herons, snakes, turtles, fish and a variety of mammals, Northern leopard frogs have a much larger problem: humans. Clear-cutting of land for lumber and development, agriculture, draining of swamps, damming rivers to form lakes and many more practices are destroying frog habitat. Environmental factors such as acid rain and the introduction of non-native species (such as invasive fish and bull frogs) are also affecting populations. Contamination of frog habitat from fertilizers, pesticides and urban runoff are also contributing to severe declines in certain areas. You can help cut down on urban runoff and habitat contamination by using environmentally friendly alternatives to everyday household chemicals. When you must use chemicals, ensure that you dispose of them properly instead of dumping them down the drain. You can also use environmentally friendly gardening products and supplies when working on your property. Use compost instead of fertilizers to provide your garden with a natural, nutrient-rich soil amendment, and since it’s free you will also enjoy reduced gardening costs. Plus, you will help our landfills, as approximately 30 per cent of household waste is made up of compostable kitchen scraps and yard waste. You can also use natural methods of pest control to help cut down on the urban runoff from pesticides that pollute aquatic ecosystems. Not only will this help preserve valuable wildlife habitat, but it will also provide your family with a safe, chemical-free yard to enjoy. Worms and beneficial insects, such as rove beetles, provide additional nutrients to the soil, and some feed on garden pests like ants, aphids and grubs. For more information about composting and green gardening practices, check our Get Gardening: Be Green and Garden Care sections. As always, leaving a part of your property wild, especially shoreline property, benefits local wildlife of all types and is a good way to give back to the environment in your community. To attract Leopard frogs to your yard, build a pond with sloping sides and plant lots of native aquatic plant species. Keeping enough foliage around the pond also helps allow for hiding spots and attract their natural prey species. To find out more about how to garden to benefit wildlife, please read our article on Gardening for Wildlife.